Self-esteem is an essential key to success in life. This self-esteem is shaped not only by a child's own perceptions and expectations but also by the perceptions and expectations of significant people in hr/his life- how he/she is thought of and treated by parents, peers and teachers. The closer her perceived self (how he/she sees herself) comes to her ideal self (how he/ she would like to be), the higher his/her self esteem is. Self-esteem can change from day to day or from year to year, but on the whole self esteem tends to develop from infancy and keeps going until we are adults. Patterns of self-esteem start very early in life, following effort and persistence. Once people reach adulthood, it becomes difficult to make changes to how they see and define themselves. • A sense of security- Your child must feel secure about himself/herself and her future. • A sense of belonging- Your child needs to feel accepted and loved by others, beginning with family then friends, neighbours etc. • A sense of purpose- Your child should have goals that give him or her purpose and direction and an avenue for channelling her energy towards achievement and self expression. • A sense of trust- Your child needs to feel trust in you and in himself or herself. • A sense of personal pride and competence- This means your child should feel confident in his or her ability to meet the challenges in life. • A sense of responsibility- You must give your child a chance to show what he or she is capable of doing by allowing him or her to take on tasks without being checked on all the time. • A sense of making real choices and decisions- Your child will feel empowered and in control of events when he or she is able to make or influence decisions that he or she considers important. This also depends on your child's age and abilities. • A sense of accepting mistakes and failures- Your child needs to feel comfortable, and not defeated, when he or she makes mistakes or fails. 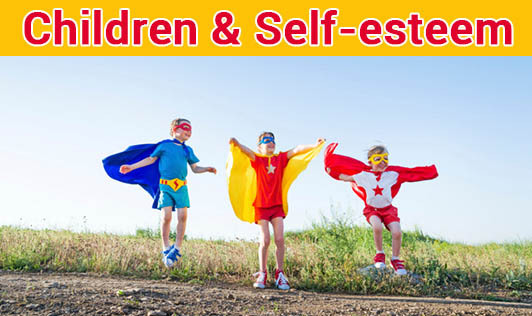 "Self-esteem affects children in many ways. For example, self-esteem influences a child's energy level, their response to peer pressure, ability to learn and grow, relate to others, be creative, make healthy choices, problem solving, and reach their goals. As a parent, you have a major role and power to positively impact your child's self esteem."